A limited amount of work was done at the Orchard Pit during this year by Gary and Mary Freeman with the assistance of the Holden brothers, Ron and Dennis. The Holden's allowed them to work a few benches on a fee basis.. True to the Orchard Pits past history, beryls were abundant. These pictures capture some of the activity at the eastern end of the pit. 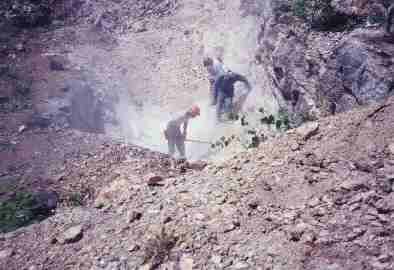 This shot of work prior to putting in a bench gives some idea as to the size of the Orchard Pit in 1997. The picture is taken standing on the headwall at the eastern end of the pit. Dennis Holden (orange hat) and Ron Holden (blue jumpsuit) are working with Gary Freeman. These 3 photos give and idea of the mineralization in the eastern end of the pit. 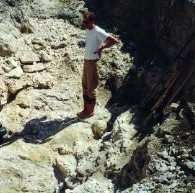 Ron Holden is standing on large microcline crystals. The center picture is a closeup of these same crystals. 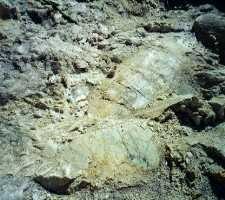 The blue beryls in matrix are just to the left of these feldspar crystals. Immediately behind these microclines the whole complexion of the OP was about to change. 1998 would provide some surprises here! 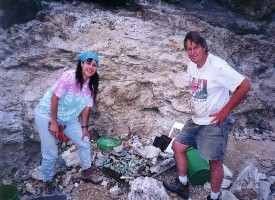 The Freemans look like happy campers with their haul of opaque blue beryl from the eastern end. 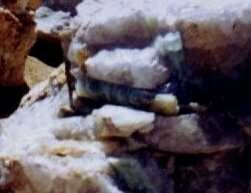 The left picture is a closeup of the beryl. At the right is a nice aquamarine trying to be gem.